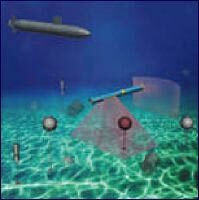 ONR and the Naval Sea Systems Command (NAVSEA) are very active in the development of future Mine Counter-Measures (MCM) capabilities in the form of Unmanned Underwater Vehicles (UUVs) for use in littoral waters*. These autonomous vehicles search for mines – located on the sea surface, tethered underwater, on the sea floor or buried beneath it – using magnetic field anomaly detectors and other types of sensors. The concept is shown in the picture at left. Following are brief descriptions of currently active Polatomic programs in this area. *Littoral waters: For the U.S. Navy, this means shallow waters close to shore, from about 40 to 300 feet deep. Polatomic has developed a Laser Scalar Gradiometer (LSG) for magnetic detection of sea mines (underwater, on sea floor, or buried) under ONR sponsorship. This system, to be mounted within a UUV, is based on a modified version of the miniature laser pumped sensor technology developed in previous programs. This system was successfully demonstrated during annual AUVFEST ’07 and ’08 sea trials with outstanding detection results. The Polatomic LSG system was recognized as the best during the AUVFEST trials. The original application for this program was the development of Helium Tri-axial Gradiometer (HTG) sensors to be used in “closed loop ship degaussing” systems for U.S. Navy ships. Such systems could be used to render ships invisible to magnetic mines. The gradiometer is created by using two helium sensor cells which are separated by a distance of one foot. Some of the tri-axial gradiometer technology developed here may also be applied to sensors for space and planetary applications.